Every architectural feature of a home needs to keep in mind the style of the property. Sliding glass doors are no exception. At Cover Glass, we offer versatility in our designs to meet the needs of every homeowner and architects' unique vision. One way we do this is through different frameless sliding glass color variations. We have four color variations — sliding glass comes in blue, bronze, clear, and grey. 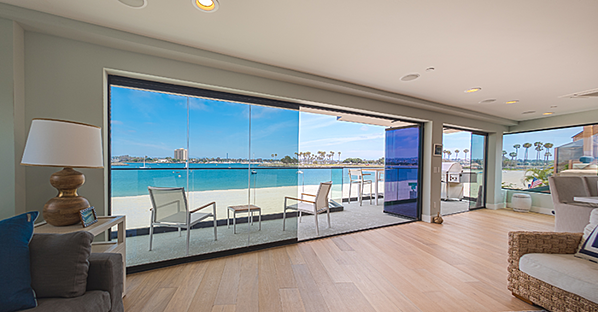 Owners of this home in Mission Bay, San Diego, made a great decision when they chose blue for their sliding glass doors. The color of the glass enhances the view of the waterfront by bringing out the tone of the sky and the water. At the same time, when the panes close, you can barely tell that the glass is tinted. However, when the panes stack on top of each other, they create an indigo aura that suits the home and adds to its contemporary appeal. The second of our frameless glass colors are bronze. A perfect example of how bronze can take aesthetics to a new level is with this home in El Niguel Country Club, Los Angeles. The property makes excellent use of earthy tones through wood, brick, and other materials. The bronze complements this theme and creates cohesion in the design. In fact, it is difficult to imagine these sliding glass doors in any different color. Sometimes, clear glass is your top option. That indeed is the case for this property in Huntington Harbour, where the homeowners wanted to take nothing away from the view. They went to extra lengths to make the most of the scenery, installing sliding glass doors that measure 23 feet in width. As the sliding glass doors connect the interior with the terrace, it was essential to maintain a sense of one large room, even for when the panes close. This effect may have been diminished with tinted glass. Another advantage of the clear glass is that enables the sliding glass doors to remain discreet when the panes are partially open to create air gaps. 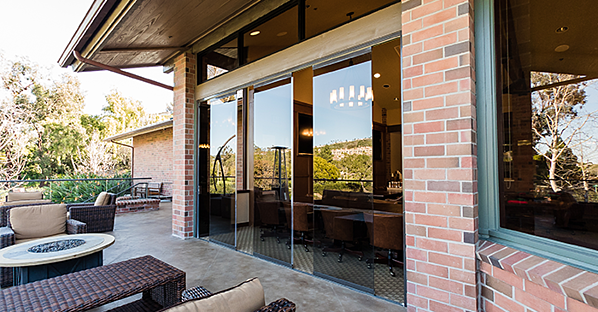 Just because these sliding glass doors feature clear glass doesn’t mean they lack color. The design uses bronze tracks and side jambs that perfectly match the color scheme of the home. 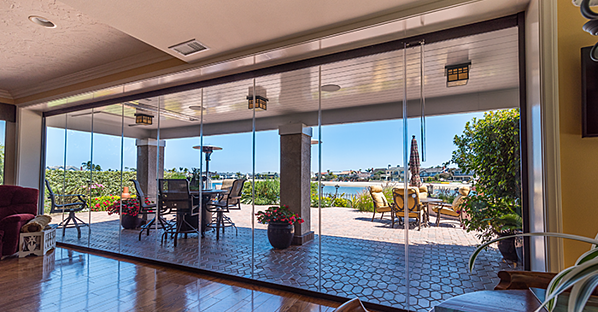 This home in Dana Point has three separate sliding glass systems, measuring a total of 42 feet in width. Opening onto an extensive exterior, the sliding glass doors use grey glass to maintain a sense of privacy inside. Furthermore, they go extra steps create a perfect indoor/outdoor experience by using a flush bottom track, a system that opens to the outside, and panels that stack neatly to the side. 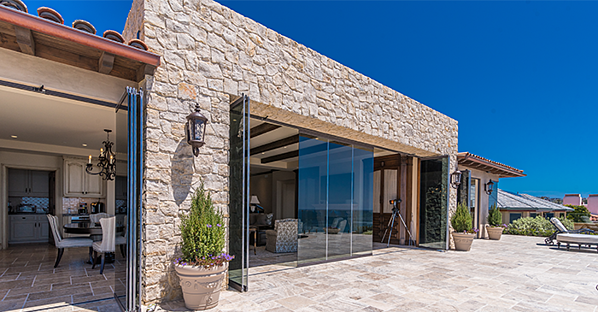 Think carefully about what color glass would work best for your home by considering what message you want to send with your sliding glass doors. If you decide glass free from a tint would be best, that’s fine. Remember, one of the frameless glass colors we offer is clear! Want to explore recent projects in your area?